Halcombe Norilsk: The Tempest. William Shakespeare. Pros. Come with a thought. I thank thee, Ariel: come. Ari. Thy thoughts I cleave to. What’s thy pleasure? 165 Pros. Spirit, We must prepare to meet with Caliban. 170 Pros. Say again, where didst thou leave these varlets? Which enter’d their frail shins: at last I left them I’ the filthy-mantled pool beyond your cell, There dancing up to the chins, that the foul lake O’erstunk their feet. Pros. This was well done, my bird. The trumpery in my house, go bring it hither, For stale to catch these thieves. Ari. I go, I go. Exit. So his mind cankers. I will plague them all, Even to roaring. 164: Cleave to (v): adhere, obey. 170: Varlets: rascals, rogues, ruffians. 172: Smote (v): past of smit (strike, hit). 174: Bending (v): turn, direct one’s steps. 176: Unbacked colts: Unbroken, untrained, undisciplined. Colt: young animal of the horse family. 177. Advanced (v): lifted up, raised up. 180. Tooth’d briers, sharp furzes, pricking goss, and thorns: thorny and prickly plants or shrubs, bushes that grow wild in the fields (Ulex, furzes, gorses, whins). 181. Shins: The front part of the leg, between the knee and the foot. 182. Filthy-mantled pool: smelly pond. 184: O’erstunk: Overstink: stink worse than, drown the smell of. 186: Trumpery: fancy garments, showy rubbish, worthless finery. 187. Stale: a stuffed bird of the species the fowler wished to take, or sometimes a live bird. 192: Canker (v): decay, become corrupt, grow malignant. 194: Even to roaring: Until they roar (shout) with pain. After severe dramas as Hamlet or King Lear, The Tempest belongs to other group of plays called romance ones that are less serious. We have read a conversation between Prospero and Ariel at the beginning of this post. Prospero is a succesful magician and Ariel his helper who makes true all the wishes of Prospero. Prospero is always talking about Sycorax, a witch that does not appear on the play, yet of whom Prospero is afraid, Sycorax had cursed Ariel to be on a island forever. Prospero has promised Ariel to make him free hence Ariel is to do anything Prospero wants. Prospero lives in the island with his daughter Miranda and also Caliban who is the son of this witch Sycorax. Prospero does hate Caliban. 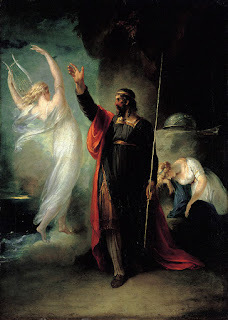 Prospero and her daughter have been living on that island because the brother of Prospero Fernando took advantage of the deep studies of Prospero as far as magic is concerned to make a coup d'etat so that be the king of Milan, Prospero was sent to an island with his daughter. 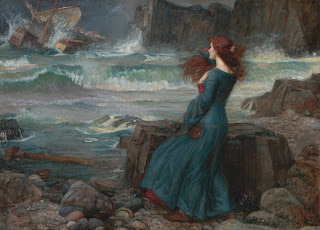 Can be interesting to say that The Tempest was inspired by two famous plays, "The Aeneid" and a traduction by Montaigne of a essay called "Of Cannibals" but it is inspired by two travel journeys one of them "Discovery of the Bermudas" by Silvestre Jourdan and other one widely popular "True Reportory of the Wracked" by William Strachey. Likewise, William Shakespeare also read a document about the state of Virginia, located in the current United States of America. Prior to this scene there is a conversation between Prospero and Ferdinand in which Prospero allows Ferdinand to marry his daughter if they do not sleep together until they are married. Ferdinand agrees. In order to fulfill such an important commitment, 3 goddesses, Juno, Ceres and Iris carry out a masque to celebrate it and praise the values that marriage epitomize. After the scene, Trinculo, Stephanus and Caliban try to kill Prospero, yet Ariel is by his side hence they are not to be so lucky. Roughly, there are 3 main themes on this play The Tempest. First of all, power and how it is handled. Secondly, contraposition between nature on its primitive state, art and culture. Thirdly, Colonization of new territories. Given the peculiarity of the relationship between Prospero and Ariel, that is the key and one of the most memorable moments on The Tempest contingent upon the fact Ariel is a good spirit who sometimes it is only seen by Prospero, it makes true all the wishes of Prospero as he helped him to escape from a curse made by witch Sycorax.